**** Chosen by Winner: Fred W.
Andrew Holzmayer has crafted a Damascus Hunter which he named "Lonely Wolf." 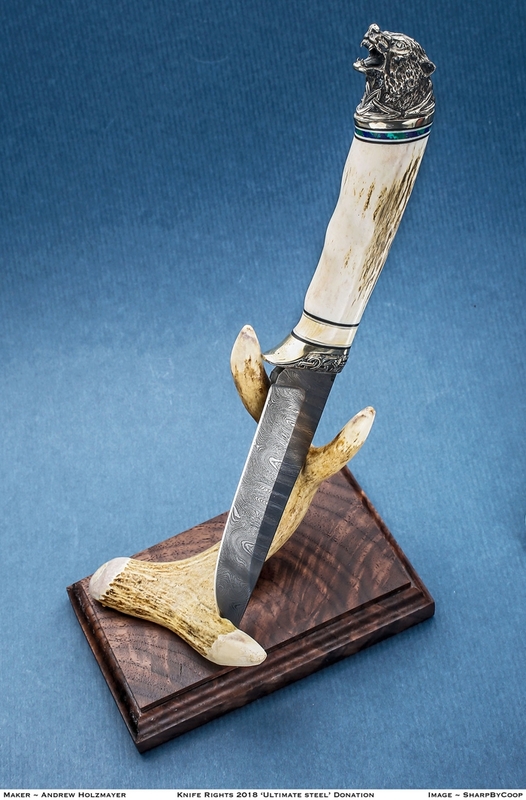 It features a carbon steel Damascus (W2 and 5200) drop point blade 4.15 inches long. The Elk Antler handle is fitted with Andrew's signature cast nickel silver guard and pommel in the shape of a Worlf's head. It is 10.5 inches overall. It includes a custom antler display stand. I started making custom knives in 1972. When it comes to designing my knives, I have two goals: great field performance and pleasing aesthetics. Attention to every detail starts with finding the right source forge for the steel. Then countless hours go into shaping, grinding and polishing, that’s just to get the perfect blade geometry. The next part of the process, making the handle, for me is most enjoyable, as it allows for more creativity with materials. There are many great finished options and stock material available. I work mostly with stabilized exotic woods, bone, leather, horn, antler, mammoth ivory, and various stones or mother of pearl for inlays… To finish the knife and bring the blade and the handle together, for me this was always a challenge because it is very difficult to find custom guards, bolsters and pommels. It is also hard to justify spending the time on custom cast parts for one-off designs, so I typically made the guards plain, ground down from stock brass, stainless steel and nickel silver bars, and laminate composites like Micarta. During the hours spent grinding the guards I kept thinking, there should be more options available for purchase. And that’s why we provide limited production of custom cast guards, bolsters and pommels and make these available to knife makers. We have new designs coming every few months. In addition to castings and we carry select Damascus steel and forged D2 blades. All to make your knife making experience a little less grinding.